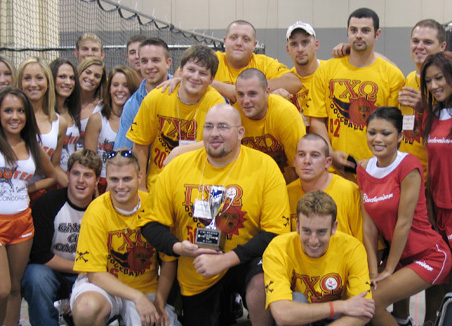 Charlotte, NC - It was another weekend full of dodgeball events for the National Dodgeball League. At the Ultimate Mans Weekend, September 30th- October 1st, the NDL hosted its Charlotte Classic Tournament. Even though the weekend was filled with body builders, jui jitsu, and grappling participants, the dodgeball section took on a life of it's own. Drawing a crowd was not a problem for these teams, most everyone wanted to see what dodgeball was all about. The NDL would like to say thanks to all the teams that participated, it was a great success. The day started off with the teams playing a round robin tournament to gain points and be placed into their final tournament bracket. The competition was intense at moments with jumping and diving all over the place, but by the end of it all here was the final standings. The winning team, Gamma Chi Omega, came all the way to Charlotte from the University of Virginia at Wise. This team plays other intramural sports together, football, soccer, basketball and just added dodgeball to the list not to long ago. A team consisting of friends and 3 of which are fighting in the War against Iraq! This was the first tournament that they entered outside of their intramural play as a team and were able to hold out until the end and win first prize. Congrats to all the teams that entered!